CATHERINE: Like just about everything, Halloween isn’t what it used to be. I have lots of happy Halloween memories from my childhood, even though my very first Halloween memory was frightening. I have written about it in a short story, HOMETOWN HALLOWEEN. I’ve posted it up on Wattpad for you all to read, if you have the time or inclination. The link is HERE. My parents had spent eighteen months building our house (which I now live in, blessedly), and we moved in the last week in October in 1950. I was three years old—just a bit shy of my 4th birthday. The interior of the house had not been painted yet—a process that would take my parents nights and weekends for weeks to come. There were no rugs on the bare walnut parquet floors or the linoleum in the kitchen. Most importantly to this story, the huge windows around our “mid-century modern” ranch house were devoid of blinds, curtains or any coverings at all. We were living in a fishbowl, which wasn’t all that terrible back then because the golf course across the lane had closed for the season and there were few houses around us in this newly subdivided apple orchard. We had a dozen apple and pear trees ringing the house, so I guess my mother thought that was privacy enough for the time being. 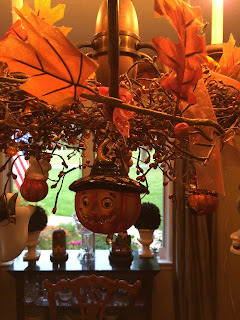 Catherine's cool 'international' Halloween collection. The clay house with the moon roof is from Ecuador. I did not go out trick or treating. I was too shy, afraid and still relating to my new house, new boundaries. I remember the kids in homemade costumes (no one bought anything from a store back then) coming to the door. They carried grocery bags or pillow cases for their loot. No plastic pumpkins or fancy felt totes. My mother handed out some treats and the kids scampered away. My brother was a year younger and only 2. He didn’t dare venture to the door with Mother and me. Several of the taller, older kids wore frightening rubber masks that sent me screaming down the hall for my dad. I’d never seen anything scary like those masks in my life. I couldn’t stop crying. Despite the cute little Tinkerbells and angels, I didn’t pay any attention to the princess looking girls. I knew I was scarred for life. After an hour or so, the trick or treating ended. Then came the scary part. The older kids in the neighborhood who knew they’d terrified me with their masks hung out in the back of our yard for another hour or so until they must have figured or saw me and my brother being put to bed. Once the lights were out, they crept up to the bedroom windows, banged on the windows and made all kinds of terrifying screams, growls and groans. The blood curdling scream I let out brought both my mother and father to my room. My baby brother started crying. The house was in a tizzy. My father stormed outside and saw the boys starting to run away. He yelled at them with his deep and very loud voice, promising to call everyone’s parents. My father, being the county prosecuting attorney, did just that. He tracked down one kid, who ratted out the others and all the parents were informed. Infractions were dealt with. And the next Halloween, our draperies were up and no one came to the windows to frighten me or my brother. Like I said, things today aren’t what they used to be. Back then, kids were accountable for their actions. Parents were responsible. And due to those virtues, Halloween might have been a bit frightening, but all in all, it was safe and fun and very sweet. 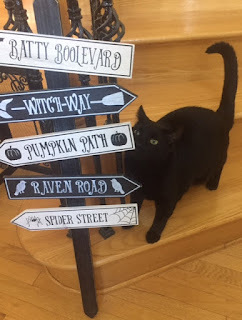 Now don't get mad at this Halloween sign in my house, Catherine! I had to chuckle since your Hometown Halloween story is an angel story from your Divine Nudge's series :). I'm surrounded by guys at home so I get a bit snarky with my humor ;). 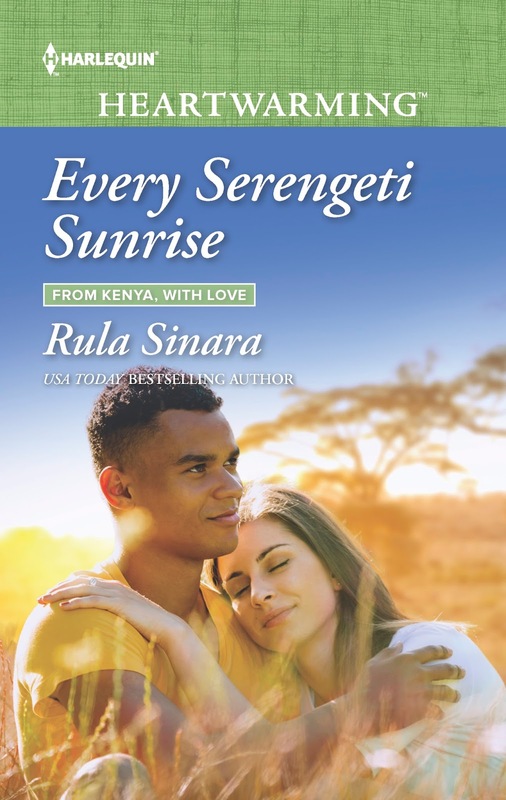 RULA: Catherine, I love this story, as well as your HOMETOWN HALLOWEEN story on Wattpad! So creepily cool! I have always loved Halloween to the point that, as a kid, on November 1st, I’d begin thinking about my costume for the following October 31st lol. I’d crawl onto my dad’s lap because he was (still is) great at telling stories, but instead of asking for a story, I’d want to talk about ideas for next year’s Halloween costume. And like you, we always made our costumes. Nothing store bought. I kept that tradition with my kids, although I think I did cave and let them buy Harry Potter and Star Wars costumes one year. As for getting spooked, I loved it! As long as I knew we kids were safe, I had a blast with it. For example, we always had haunted houses made at our school or at one of our neighbor’s houses. Usually the older teenagers put them together, doing things like jumping out from behind a sheet dressed like a bloody monster or vampire or blindfolding us and telling us we were touching brains when it was really a bowl of spaghetti. I could go on and on. Teenagers can be super creative! I was one of those kids who would hear or see ghosts, so I preferred to sleep with my lights on. I guess I did spook easily when I was really young…like around six. It all depended on the situation as to whether I considered it fun or not. But when I grew into my tween years, I embraced it all…down to uncanny incidences with the Quija board. No seriously, I could go on about spirit encounters, similar to the one Catherine tells about in her story. However, as an adult, I went to a public haunted house once with some cousins and the parking lot was filled with guys walking around with working chain saws (yes, movie reference). That freaked me out a little because, although it was supposed to be part of the haunted house experience, what if some psycho decided to join the group? How would we know them from the rest who were ‘acting’ psycho? Scared or common sense on my part? Maybe both. Rula's cat, Nimbus, wondering which direction the cat food is in. He weighs about 20 lbs but has never eaten Halloween Candy. Good thing. So do you have any spooky ‘real life’ Halloween stories that happened to you? Do you decorate and what’s your favorite item? Is it something you’ve had since childhood? 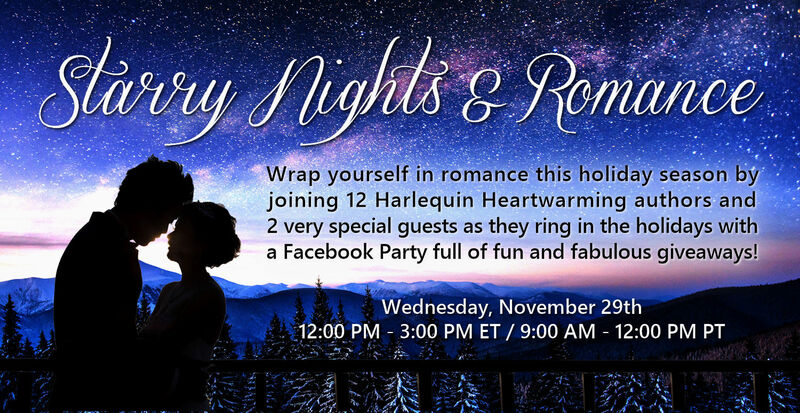 Oh, and before we vanish like ghosts, we'd like to congratulate all the October authors on their releases and give you a haunted heads up on a fabulous Starry Nights & Romance Facebook Party November 29th. We know you're been eagerly anticipating all that free Halloween candy but those treats are nothing compared to what we have in store for you. The December authors are hosting a holiday and book release celebration with tons of fun posts and incredible giveaways by all the Heartwarming October, November and December authors! Plus, we have two special guests joining us...Jennifer Snow & Muriel Jensen! More details and rsvp HERE on the Facebook event page. You won't want to miss this! A great post, ladies. I love Nimbus's interaction with the decorations. So happy to be in the December lineup with you. Liz, once when I was taking down Halloween decorations and piling them up on the breakfast table, I turned to add some to the pile and jolted when I realized Nimbus was napping in the middle of them lol. He blended right in! He's one funny and peculiar cat ;). Excited to be releasing with you too! Rula, awwwww. What a cute story!! 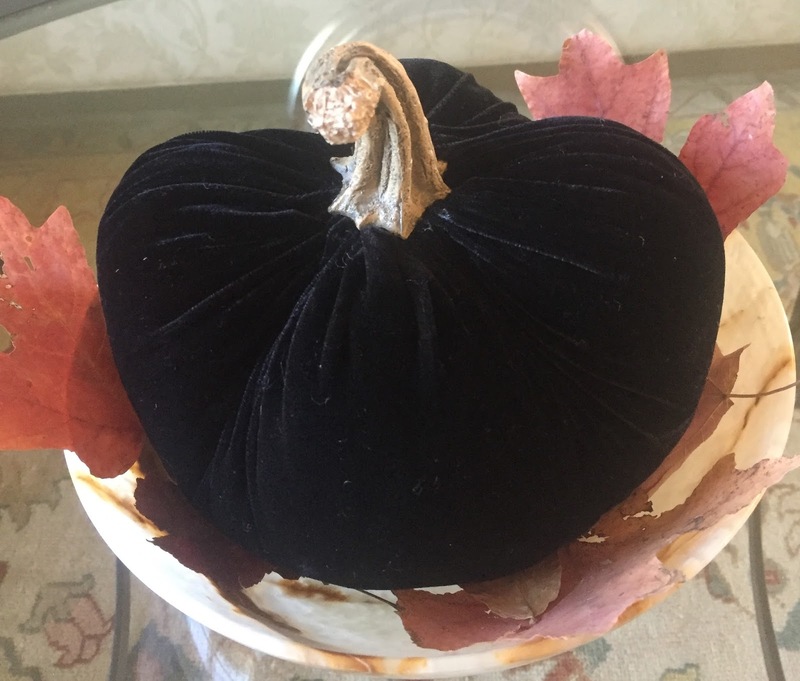 I always break out my autumn decorations on September 1st, even though temperatures can still be in the 90's. As a child, I was always a little apprehensive about Halloween. I was also petrified of haunted houses...still am. Fun post, ladies! Jill, to be honest, I'm STILL a fraidy cat. I can't do the haunted house, horror movies or even walk down a dark hall. I like Christmas movies and happy ending books. That's why my TBR is chock full of HEARTWARMING books! 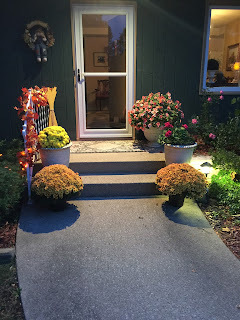 Jill, I put out my fall decor in September, then add my Halloween items in October...then take away the Halloween and leave the fall stuff up through Thanksgiving. I get mileage out of my decor lol. And re horror movies, let me be clear. I can do the Poltergeist, Amityville Horror, Jaws, Aliens or Jurassic Park type of scary...but I draw the line at psychotic/disturbing stuff. That's whey the chainsaws at that haunted house were too much for me. I can't let my guard down and have fun with the 'scare' unless deep down I know I (and others) are safe. My kids laugh at the fact that I jolt and scream so easily. But I draw the line at psycho/disturbing stuff. I haven't even seen Silence of the Lambs. Can't go there. NO WAY would I see Silence of the Lambs. I'm with you there on those Psycho thrillers. EEEEEEEEEEKKKKKKKK! We are giddy glad to celebrate our birthday book month with you, as well, Liz. We're gonna have fun! What a great post! I love the decorations! This will be the first time I've decorated in years. We lived so far out in the country that we never got trick or treaters, so I didn't bother decorating. Two years ago we moved closer to town, so I'm dragging my decorations out again. I loved Halloween as a kid. We always set up haunted houses in the barn. It was great. It was understood that when you got older, you no longer went trick or treating, so the tradition was to go cover the football coach's house with toilet paper. Except he knew we were coming and sat on the roof with a high power water hose, so we were the ones who got surprised. It was so much fun. Since moving closer to town, my door is flooded with teenagers and adults doing all the trick or treating. Sometimes adults bring their infants to the door to get candy. It used to be for the kids. Now it's just a chance to get free candy. Oh, lol, LeAnne at your coach on the roof with the hose. That's too funny! I don't get as many trick-or-treaters living in the country but I decorate for me and my kids ;). And apparently for my cat Nimbus too lol. 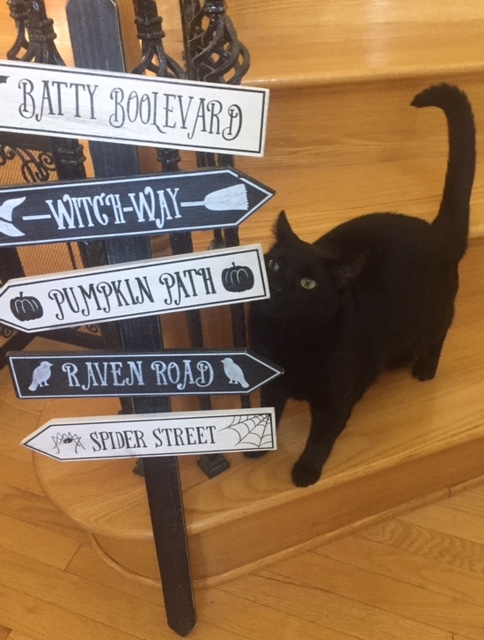 It's too funny because from all of my cats, he's the only one obsessed with Halloween decorations. LeAnne....That is the best story! I'm looking forward to this year's trick or treaters. I don't get many since my street only has houses on one side. And yes, the adults bring those babies and since I work in a dental office..I'm thinking....isn't this a bit young for so much sugar? Come to think of it, didn't I recently read something about a law being passed in Canada that restricts the trick-or-treating age to under 14 or something like that? Canadians chime in here! Ladies, thanks so much for sharing your Halloween memories. I'm still smiling. Except, Catherine, yours is awful. I've always been easily spooked and those boys scaring you like that is terrible. I love your dad for putting a little scare into them! My favorite Halloween memories are of trick-or-treating in our country "neighborhood" (in homemade costumes) where the houses are 1/2-mile or more apart and driveways were even longer. The miles we walked for a piece of candy, Lol! Oh, thank you, Carol for this. That story comes back to me every October of my life as I walk down the hall of my house. That's pretty crazy, huh? That an incident from the age of 3 or 4 can still "haunt" a person all their life? But then...isn't that what writer's are known for? Odd Bodkins and Idiosyncrasies? I love your adventurous need for that Halloween candy! Wow. A half mile! Impressive. Carol, our houses are far apart like that too! When we first moved out here, most of the neighborhood kids were too young to walk to every front door in the brisk air, so I remember one dad had the truck and attachment to drive everyone around hay-ride style. Now, most of those kids are older and want to go off to do their own thing. My brother and I had our favourite trick-or-treat houses on our street and I know yours - Catherine and Rula - would be on our list! Heck, I'd like to visit your houses on Hallowe'en now! As to the ghost story, shivery! Telling and reading ghost stories to students at Hallowe'en was always on my teaching agenda. Now that's a fun, cool idea. We should have an author's Trick or treat night. Going to each others' Facebook page and saying Howdy on Halloween. Thanks for stopping by! Passing out the virtual candy!!! I used to love Halloween. As kids everyone in our small town got to trick or treat. As teens we had parties in local barns with square dancing, apple bobbing and later after I married and we moved, we had parties with wine tasting and scavenger hunts. Some of those were hilarious. Then a few years ago someone added spiders which I loathe. Ugh. I hate even going to stores now in Sept & October. And after I moved to this townhome, no one in 6 years has come to trick -or- treat. I bought candy up until last year and ended up giving it to my sister's church pre-school. I did just decorate, though--sans spiders. Love pumpkins, ghosts and black cats. You ladies make us think and reflect with your post. Don't come to our house, Roz! We're big on spiders here. And rats. Rats eating severed hands and legs. We make up for it by handing out loads of candy! Love it, Roz! We used to adore apple bobbing when we were kids. Now when I see it being done, I can't help but wonder about all the mouth germs floating in the water lol. I'll stick with caramel apples ;). As if all the sugar is any better for me. Oh, and being in the country and never using pesticides (all about organic here), I don't have to decorate with spiders. We have real ones...big too...everywhere this time of year. They don't scare me, although my youngest is only just now getting over his fear of them. I think the massive webs they make overnight in the garden are beautiful with morning dew reflecting off of them. Okay, so I'm weird lol. Roz, what lovely memories. Square dancing and apple bobbing. I love that image. We had a couple October kid birthdays in our neighborhood and for years they had apple bobbing. I never got one. Sad. But I have to say, I don't like the spider thing, either. I just got my white pumpkins and when I carve them, I fill the orange inside with glitter and when it's lit, it's so lovely, sparkling and happy. I have yet to get my Cinderella pumpkin. A must every year! My husband once argued the point that I've since espoused. Halloween is more about giving than Christmas. It doesn't matter who comes to our door, neighbour or stranger, or how they look, pretty or gruesome, or even if they utter threats (Trick or treat! ), they will be given a gift. Halloween is a great way to meet the neighborhood in an open and friendly way. And the last great benefit: It lasts just one evening. OMG, this is so on point and I love the observation so much, I may have to quote you on social media!! And since Christmas is traditionally about giving, you really have me thinking about why it is that, although both holidays are commercialized quite a bit, people do seem more likely to forget the 'giving' side of Christmas and more likely to fall victim to stress, spending big bucks and wish (aka 'want') lists. Go figure, with Halloween it's cheap candy and everyone has fun. Maybe it's because there aren't any expectations beyond a little (or big) sugar rush. How right you both are! What a lovely way to look at Halloween. It's really true, isn't it? Thank you so much for sharing that perspective with us. It certainly made me think. Love all your decorations, Catherine and Rula. Catherine, I would have been terrified. I lived on a farm, but at Halloween I'd join my friend in town for trick-or-treating. I remember a house that went all out with decorations. We rang the doorbell, and spooky groaning noises started. We looked at each other, wide eyed, and then we ran. The homeowners loved it, laughing so hard they could hardy manage to called us back to get candy. I'm looking forward to the facebook party. Too funny, Beth! My teens like to hide behind bushes and jump out when trick-or-treaters come. If I see little ones coming up, I warn my kids not to do it. For teens looking for candy, it's a whole other story lol. Oh, and we had someone in our town who would attach an enormous (as in the size of a roof) spider on their roof. Talk about arachnophobia! We are so happy to share December with you. Also my actual birthday month. So, book birthday and real birthday. I'm looking in my Halloween crystal ball and seeing cake in my future! Loved the table. Halloween is a big deal where I live. People decorated for days, even though we don't have that many kids on our street. Catherine always has such lovely table settings for each holiday. I love that your neighborhood is big on decorating! Shirley, I wish my neighbors could meet your neighbors. I'm the only one with Halloween lights outside. And I didn't go all out this year, but it still looks better than just...well, nothing! ACK! And thank you for the compliment, Rula. I love love love, tablescaping!!! Catherine & Rula, hello! :) All of your Halloween decorations are STUNNING - wow! 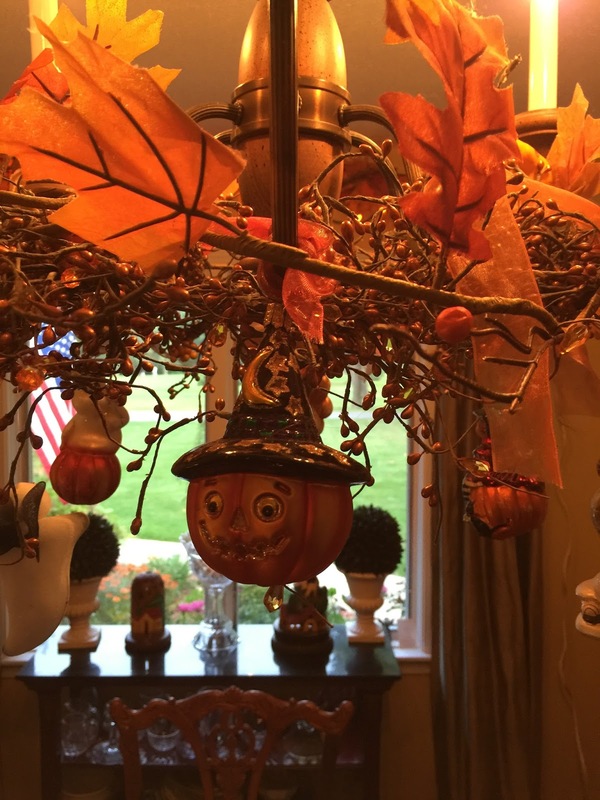 I love when people go all out for this fun holiday and Rula, you have such a perfect year-round Halloween "decoration" living with you! Kudos for you for having a black cat, they get such bad raps at shelters. :) :) Happy Halloween and congrats on the new, wonderful-looking books! Hi Krissie! Thanks :). And yes, you're right about black cats (I hear dogs have the same issue too, though there are a lot of superstitions regarding black cats). In fact, although 'Black Cat Appreciation Day' already passed on Aug 17th, 'National Black Cat Day' is coming up on October 27th! 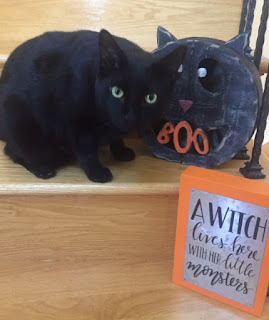 A few years ago, I was at a Halloween party on the 27th and I made a witch's hat decorated with the date and a 'adopt a black cat' message. Everyone I know who has/had a black cat, says that they have the best personalities. Happy Halloween!